Old letters and accounts written by the first non-indigenous women who settled in the Cariboo reveal a life both rich and full of hardship. In one diary a typical day in winter is described by a woman whose husband was away in the bush hunting. Fire lit, four children under 6 fed and dressed – she left them in the house (babysitters were unheard of and according to a number of the accounts I have read, children as young as four were reliable to be left unattended) and tended to the livestock close to the house before hitching up the team and heading several miles to where the hay was kept, loading up enough hay to feed their cattle for the day and then heading back to the homestead. Another job en route was breaking the ice on the nearby lake so the cattle and horses could drink. Then back to the house for the unending chores of the day and the extra work created by several feet of snow outside and sub zero temperatures. Despite the grinding day in and day out work, the inhabitants found time to get together with neighbours for parties and dances. Horse drawn sleighs were common in the region and often small vacations would be taken – visiting several households over a period of about a week. Family and friends were of the utmost importance here – my sense is that this interconnectedness and the physical fitness of the people then was responsible for many of these women living well into their 80’s and 90’s. Marjorie Abram (nee Dench) with her hunting dogs and rifle. 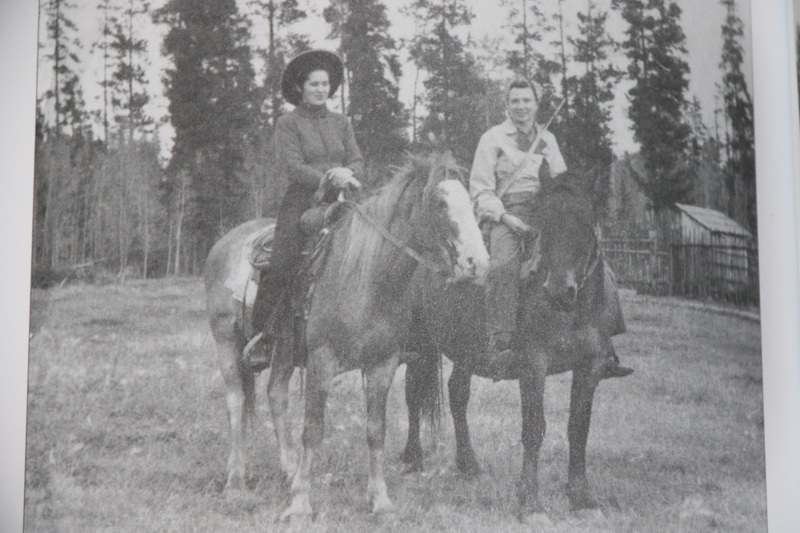 Majorie settled at Demspey Lake north of 108 Mile house with her husband Art Abram in 1938. They built and ran a hunting and fishing lodge in 1946. The lodge burnt down in 1958 and the Abrams relocated to Victoria. They moved back to Dempsey lake in 1973. Their son Arnold still farms the property. One of Arnolds earliest memories of his mother is when he was about three and riding on the saddle in front of his mother on the way home from a neighbours. His mother suddenly told him to hang on and using her rifle dropped a belligerent bull moose from her horse. She then continued the ride home and brought the menfolk back to butcher the moose before the local coyote and beer populations located the carcass. Hazel Park and her friend Joyce Walker. 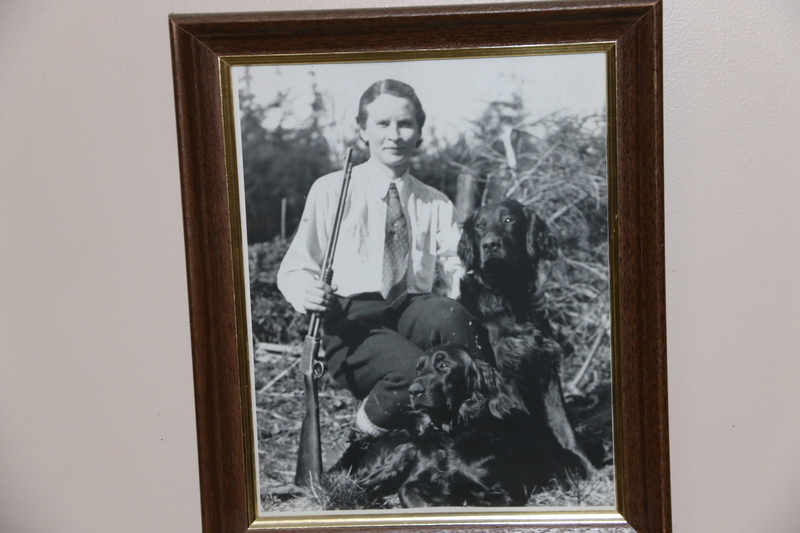 Joyce came up to visit hazel from Vancouver every fall to go bird hunting on horse back. 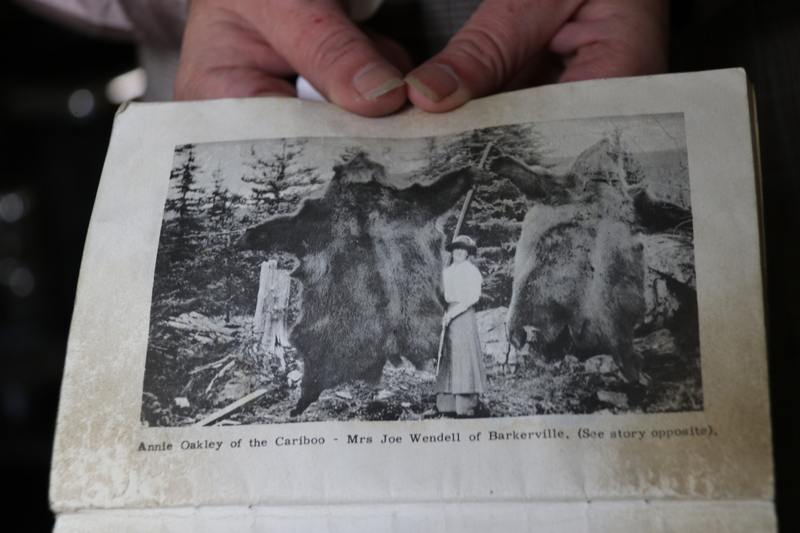 Dorothy Wendell of Barkerville was out hunting with her husband and another gentleman when she wandered off from the main party. The photo above shows her with the two hides of the grizzlies she shot that day. One surprised her coming out of the bush. She shot it and waited as often a grizzly would suddenly come alive again if approached too soon and maul or kill its attacker. She thought she saw it move and shot again – killing a second bear. The dumbstruck men appeared moments later. There were some women who didn’t make the transition to the Cariboo world. One interesting story is of a wealthy British spinster who arrived to homestead in 1924-25 in the Bridge Lake area. Gertrude Boulter lasted one winter before escaping to Guadulajara Mexico – the transition from upper class British home to a Cariboo winter in a log cabin must have been quite an experience. Her letters have never come to light but would be an interesting read if found. Strong women were admired in the region. When a local boy told his father that he wanted to marry the small., pretty daughter of a neighbour, his father said that she didn’t look very strong and was small. His son replied he was marrying a wife not a work horse :-). The union was a highly successful one and their decendents live in the area to this day.